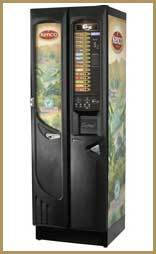 The Refresh 1400 is the largest of the Darenth range of In Cup machines. It uses the high quality Kenco range of In Cup products that includes a variety of Kenco coffees, PG Tips tea, Suchard chocolate, Knorr soup, Bovril and Kenco Cappio. Up to 10 of these In Cup selections are available in this machine. The Refresh 1400 also features a large sugar dispenser meaning that all of the drinks are available with or without sugar. The operation is completely automatic with all drinks being dispensed at the touch of a button. A variety of payment systems are also available. The Refresh 1400 can be set up as a purely free vend machine or can accept a change giving coin mechanism and/or the Darenth I Key cashless payment system. The I Key allows for loading of credit onto a key or for a certain level of discount to be given. This may be a percentage off the selling price or in the form of a number of free drinks per day. 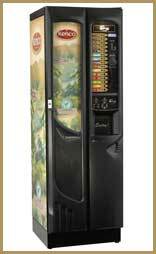 The Refresh 1400 is also designed to bank with other Darenth equipment including the Snack Break snack vending machine, indeed the two machines are designed to be completely interfaced if required. This interface includes the ability to run off of the same payment system, be it a coin mechanism or the I Key system. The Refresh 1400 must be plumbed into the mains water supply. This allows for the fitting of a commercial water filter that will help to stave off potential technical problems caused by hard water (a particular problem in the South East of England). The other big benefit to a good quality water filter is that it gives you a noticeably better quality of drink. The Refresh 1400 coffee vending machine is ideal in sites where a large number of hot drinks need to be vended per day. It has worked well in large offices, warehouses and factories. Kenco Local Business Service are a supplier of this machine across the London region. We can also supply all of the service support and training that you may require as well as being a very competitive supplier of the full range of Kenco In Cup products. Our warehouse near Hemel Hempstead allows us to offer an unrivalled service in towns such as High Wycombe, Aylesbury, Watford and Hatfield as well as London itself.